The largest city in the U.S. state of Minnesota and bisected by the Mississippi River, Minneapolis exists as a unique blend of natural beauty and urban development. While there are many parks and lakes, Minneapolis is also a hub of cultural landmarks and entertainment. Whatever you plan to do on your visit, everyone needs to eat; here are some of the greatest places to satisfy your need for cheese and all that is pizza! Featured on Food Network’s Diners, Drive-Ins and Dives, Pizzeria Lola is a modern pizzeria serving delicious wood-fired pies and wines from around the world. Some favorites include the My Sha-Roni! made with the house red sauce, mozzarella, pepperoni, and house made fennel sausage and the Lady Zaza topped with house made kimchi and Korean sausage, serrano peppers, scallions, and a sesame soy chili glaze. If those don’t catch your eye, there is plenty more to choose from, all wood-fired with house made ingredients, and all with dynamite flavor. Pizzeria Lola also has a list of beers and sodas in addition to the great selection of global red, white, and sparkling wines. The atmosphere is bustling with pizza lovers, and the decor is vintage, with an old school photo booth to play with while you wait for your bubbling platter of goodness. Situated in a rustic cabin-like establishment, Element Pizza serves some of the best wood-fired pizza using the freshest and highest quality ingredients, including dough that is made from scratch daily. The international chef at Element has been crafting pizza for more than 20 years, dedicated to pleasing every customer who walks into the family-owned restaurant. You might choose one of the specialty pizzas off the menu, or create your own with a combination of any of the 30 or so toppings. In addition to pizza, Element also serves a variety of starters like humus, spinach artichoke dip, and spice feta cheese dip as well as crisp and delicious salads like the garden, Caesar, spinach, and Aegean. Everything at Element Pizza is made fresh with flavors and textures to prove it. As the first coal-burning pizza restaurant in Minnesota, Black Sheep Pizza seeks to honor the origins of pizza-making in the United States. When pizza first came to America, coal was burned in the first ovens used to bake pizza in the states. Since then it has evolved to wood-fired and more modern oven methods, but Black Sheep keeps with the coal-firing tradition and the best ingredients possible to create the great American pizza for all guests. Choose from a menu of specialty 12 and 16-inch pies, go for the square Sicilian, or create or own with any variety of Black Sheep’s toppings. Beverages include soft drinks, lemonade, organic milk, and chocolate milk for the young ones, while the 21 and over crowd can pair their pie with any one of the beers on tap or house wine selection. Black Sheep produces wonderfully crispy crusts and imaginative toppings in an industrial environment that pair well with the coal-burning homage to American pizza roots. Eco-conscious through and through, Galactic Pizza creates light and delicately flavored pies with organic and locally grown ingredients. In addition to the vegan and gluten free options, Galactic Pizza runs with a mission to make a better future. Recyclable and biodegradable packaging, electric delivery vehicles, and a building run on renewable wind energy all contribute to this goal to save the future. If that isn’t enough, the decor of Galactic mirrors its mission with a spacey new age theme and spandex-clad superheroes for delivery service. With options like the Thailander topped with spicy Thai peanut sauce, mozzarella cheese, marinated free range chicken, and Asian veggies or the Alfredo made with creamy alfredo sauce, mozzarella cheese, organic roma tomatoes, organic broccoli, and marinated free range chicken; pizza can be healthy and just plain delicious! 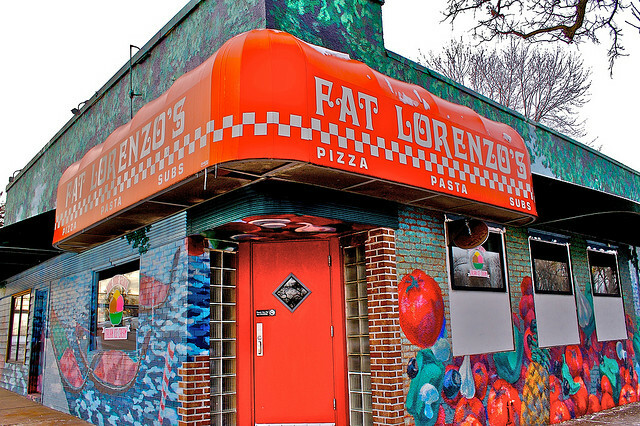 A popular family pizza stop for locals, Fat Lorenzo’s offers a menu of pizzas just as colorful as the funky murals that deck the walls. Beyond the specialty pies (Fat’s, Slim’s, Afrenzo, New Haven, and Carne) Fat Lorenzo’s allows you to create your own pizza from a long list of toppings, or dive into a plate of their award-winning pasta. If you are looking for a casual Italian place that serves more than just pizza, Fat Lorenzo’s also specializes in both hot and cold hoagies from salami and cheese to garlic chicken with marinara. You’ll also find a rotating selection of homemade Italian gelato. From the more traditional chocolate and lemon, the gelato chef at Fat Lorenzo’s has gone to create over 100 flavors, including coconut, vanilla bean and Jamaican rum. With dinner and dessert, you are sure to leave Fat Lorenzo’s feeling stuffed and happy.